Account Administrators can create, edit, and delete users. This support article illustrates how an Account Administrator can create a new user, and assumes that there are currently available licenses on the account. 1. 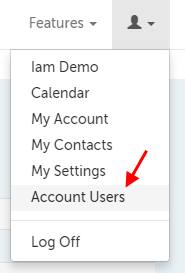 Click on the profile icon in the upper right-hand corner and select "Account Users" from the drop-down menu. 2. Use the "Create New User" button in the lower left-hand corner. 3. Enter the name, e-mail address, time zone, phone number, and website (if applicable) for your new user. 4. Indicate what roles you would like the new user to have. "Videoconference Session Host" will be automatically checked, but you can remove this prior to saving. "Videoconference Session Participant" will be automatically checked, and is required for all account holders. 6. Their account will be created once you click "Save", and an email will be sent to their address with the temporary password you have set. They will be required to change their password the first time they log in.